New headlines and images from Winter 2017-2018. The CLIMATEGATE article continues below. Click this link to jump to the start of the article! Intense winter weather continues to wreak havoc on Europe as frigid temperatures, heavy snowfall and icy roads create treacherous conditions. More than 35 people have died in Belgium, England, Scotland, Serbia, Slovenia, Sweden, the Czech Republic, Spain, France and Germany in weather-related accidents. Schools and universities have been shut due to blizzards and icing. Red alerts were issued in England, Scotland, Wales, Croatia and Sweden while an orange alert was declared in France, Spain and Belgium and a yellow alert in the Netherlands. BUFFALO SETS NEW SNOW RECORD! With a huge snow storm impacting Western New York, The National Weather Service has declared that Buffalo set a new Snow record for March 2nd! Heavy snow brings travel chaos to UK Heavy snow fell in many parts of the UK on Sunday as Storm Caroline, the biggest storm so far this year, caused widespread disruption with road and air travel severely affected. Photos: Unusually early, heavy snow creates 'winter wonderland' from Texas to Georgia In southeastern Texas, 7 inches of snow was reported on the south side of Corpus Christi, Texas, and thundersnow was also reported in the area. According to the Corpus Christi Caller-Times, the most recent accumulating snowfall in the city came back in 2004. Snow in Europe triggers transport chaos More than 300 flights were cancelled on Sunday at Frankfurt airport, the busiest in Germany. Winter is definitely coming - it’s already snowing in northern Spain It’s still hot and sunny in southern Spain and beach lovers are jetting out there for a last blast of sunshine before autumn sets in. But it’s a different story in parts of northern Spain where snow has fallen this week, much earlier in the season than normal. 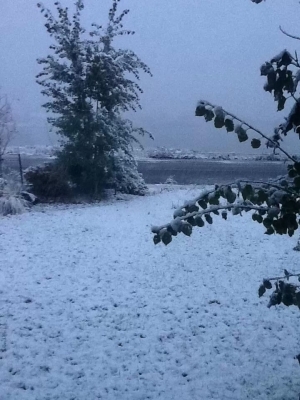 Snow Falls In The Sierra Nevada On Summer's Last Full Day It's still technically summer — the autumnal equinox doesn't arrive until 4:02 p.m. ET Friday. It was a tad unusual then to see it snowing Thursday in the Sierra Nevada, the mountain range that is shared by California and Nevada. It usually doesn't snow there for about another month. September snowfall has ski shops full of excited skiers With snow building up in the mountains, many people are preparing for ski season and ski shops are preparing for anxious customers. Ski resorts don’t open up until after Thanksgiving, but that’s not stopping some extreme skiers. Winter weather in Idaho's mountains on the final day of summer Today marks the final full day of the summer season, but there won't be much that is summer-like about our weather today. In fact, Bogus Basin picked up an inch of snow overnight and there are Winter Weather Advisories in place for Idaho's east central mountains; elevations about 8,000' could pick up a foot of snow through tomorrow! It was snowing again on Stevens Pass Tuesday night, and the National Weather Service said 5 inches of snow fell the night before at Paradise on Mount Rainier -- the most snow that has fallen there this early in the year since 1978. Let me preface this by saying I come from a science background myself, but all too often science gets hijacked and distorted for political or economic gain, or simply makes goofs which are perpetuated by arrogance! Why should we not just blindly trust science? Prior to the 14th Century Astronomers thought the Earth was the center of the universe, because, well, that's what the church wanted, and spent hundreds of years of scientific research on the theory of Epicycles, trying to reconcile the Earth centered model with the observed motions of the planets. Epicycles hold the record for longest running scientific goof in history! 17th Century doctors thought rubbing chicken dung into your scalp would cure baldness! They also thought leeches sucked disease out of patients. 18th Century Geologists thought the Earth was 6000 years old, because, well, that's what the church wanted! Prior to the 1950s, scientists thought proteins carried our heredity. Until the 19th Century, doctors thought infection was caused by bad air, from which we get the term "Malaria." ... the origin of the phrase "blowing smoke up your a**!" In 1948, the Nobel Prize in Physiology or Medicine went to the discovery of DDT. A few years later it had almost collapsed the food chain. In 1949, the Nobel Prize in Physiology or Medicine went to the discovery of the "therapeutic value" of lobotomy! Patients had their brains butchered by having what was essentially an ice pick shoved up their nose into their brains! Until 2005, doctors thought ulcers were caused by stress. National Geographic ran an article in 2015 whining why people don't believe science. But science is not about belief but about facts! And National Geographic should not be questioning why people do not trust science after its own 1999 "Piltdown Chicken" scandal! Science is not perfect. Science does make mistakes. The beauty of science is supposed to be that they admit it, not use the label of "science" like a modern religious icon to push agendas onto people! Anyone who says the "Science is settled" is not being scientific, they are being propagandistic! You are witness to one of the greatest frauds perpetrated on the people of planet Earth, to trick them out of their money and into obedience under the guise of the fight against Human-Caused Global Warming (now rebranded "Human Caused Climate Change" to explain away the icicles we were told were not going to happen). The global warming scare was concocted out of outright lies, purchased science, and scare mongering to trick you into being willing to pay carbon taxes to solve a non-existent crisis you were told was all your fault. And, of course, to lull you into accepting the dictates of a global government that needed to save the Earth from you icky-poo human beings. It was all a lie. Here is how it happened. 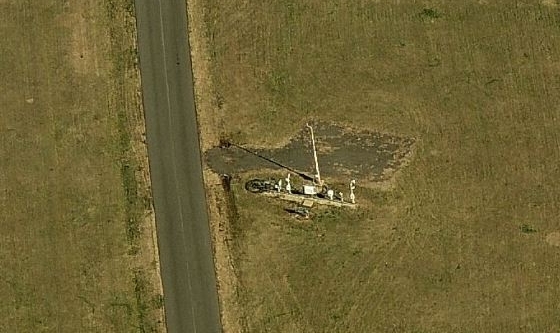 The 2009 exposures of fraud coming from the Hadley Climate Research Unit, then followed by similar exposures at New Zealand's NWIA, Australia's climate center, NOAA, the Climategate emails, and now Climategate 2.0, have only confirmed the doubts arising from the obviously NON-scientific methods employed by the Anthropogenic Global Warming supporters, hereinafter called the "Global Warming Cult". 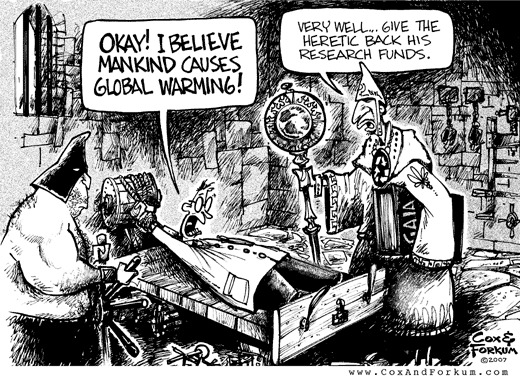 I call them a cult because of the abandonment of scientific method by many of the acolytes, together with a recent British Court decision that declared belief in Global Warming was accorded the status of a religion. Then there was the admission by NOAA that the temperature data provided by their NOAA-16 satellite, on which the claims for a warming planet were based, were in error. A problem with the satellite meant it was reporting temperatures from 10 to 15 degrees hotter than they actually were. NOAA erased the data from their servers, but global warming propagandists still cite it in their claims of a warming world! It is interesting to note that NOAA did not detect the problem themselves, but only checked the data when outside observers pointed out that it was not consistent with ground observations. Human Caused Global Warming is not being researched; it is being promoted. Al Gore and his fellow investors have spent over a hundred million dollars in creating a crisis of human-caused global warming out of (quite literally) thin air. They are not doing this out of the goodness of their hearts. They expect to reap billions in profits from the trading of Carbon Credits, a "license to pollute" available for a price and subject to brokerage fees. One of the people Al Gore relied on to create this scheme was Ken Lay, late of ENRON, aka the Crooked "E". Al Gore plans to use Carbon Dioxide to do to the world what Ken Lay did to California using electricity; loot the people! Coincident with the desire to reap huge profits from the general population of the world is the agenda to promote a global government. Currently, the push for a global government rests on three pillars, Global Warming is one of them, leading to a surrendering of national sovereignty attempted at the Copenhagen Conference December 7th, 2009 (but temporarily delayed when the conference was hit with a major blizzard). The other two pillars exploited to create the "need" for a global government are a global swine-flu pandemic, requiring a global health organization, and a global financial crisis, requiring a global bank. The political power behind this push for global government is immense; enough to win Al Gore an Academy Award and a Nobel Peace Prize for his film, "An Inconvenient Truth", despite a court ruling pointing out the numerous provable lies and distortions in it. 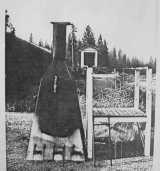 To any real objective observer, the methods employed by the Cult are not those of science and research but of salesmanship and propaganda. Scare tactics are well in evidence. 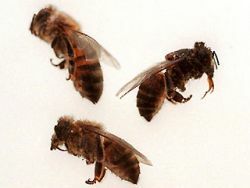 To anyone of an age enough to recall previous scare campaigns, the hue and cry for Anthropogenic Global Warming is reminiscent of "Killer Bees" and Y2K scares of yesteryear. Here are some examples of monumental deceptions perpetrated throughout history against the people by the ruling class. One of the fastest ways to get attention and funding is to announce the imminent doom of the world, then ask for money and/or obedience to study and perhaps "solve" the problem. As the 20th century wound down, concern was raised over the fact that most calendar functions inside computers were "hardwired" with the leading "19", and that as of midnight, December 31, 1999, computer date functions would leap backwards one hundred years to Jan 1, 1900. Now, while it was true that some dedicated clock and calendar chips did in fact have the hardwired "19" problem, the reality is that most calendar functions were already being handled totally in software and for those that were not, a changeover to software calendars able to deal with the year 2000 was a trivial exercise. But so convincing were the scaremongers that the public started pulling their money out of banks in anticipation of a crash. As a result, corporations had to spend far more money on demonstrations to convince the public that Y2K was fixed than they spent fixing Y2K. In the end, Y2K turned into a 6 billion dollar enterprise that reaped huge profits for the scaremongerers-turned-software patch and "assurance testing" entrepreneurs. "It will without doubt have come to your Lordship's knowledge that a considerable change of climate, inexplicable at present to us, must have taken place in the Circumpolar Regions, by which the severity of the cold that has for centuries past enclosed the seas in the high northern latitudes in an impenetrable barrier of ice has been during the last two years, greatly abated. World about to end from Global Warming in 1932. 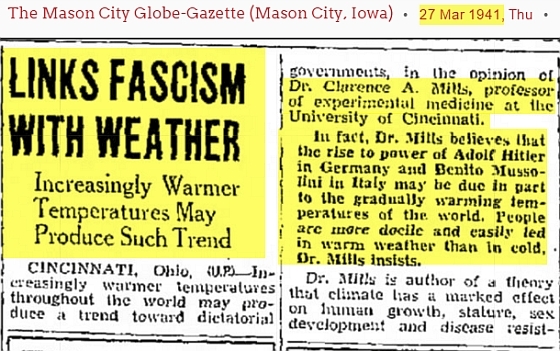 Global warming caused Hitler and Mussolini, 1941! World about to end from Global Warming in 1947. 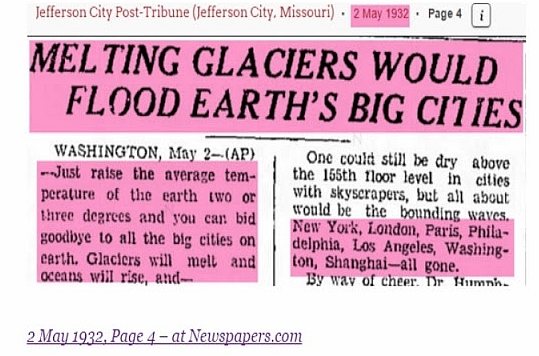 In 1958, Global Warming again was the fashion! 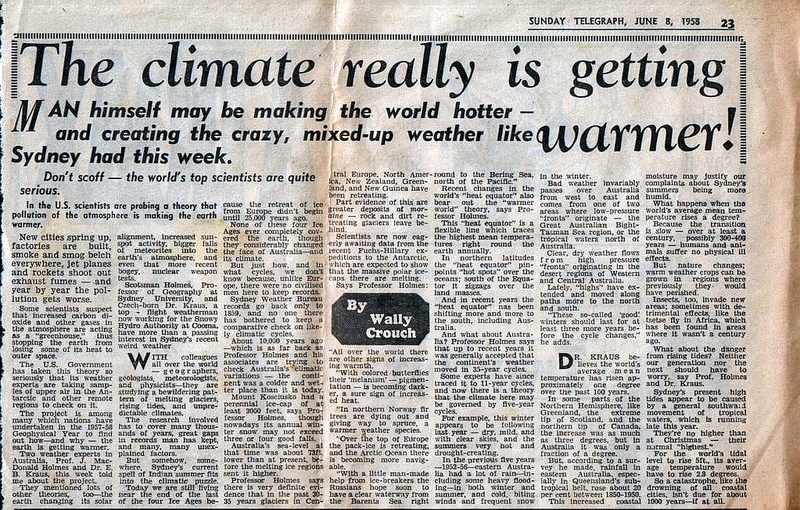 Then, in 1975, having exhausted the funding to study how global warming was going to destroy the Earth, climatologists did an about-face and started warning of a new coming ice age, requiring new funding to study and of course, more attention from a media totally bored with global warming! 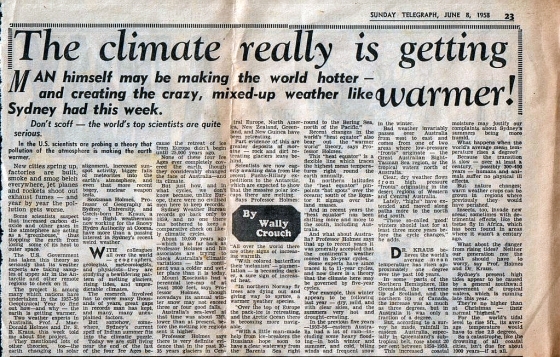 In the 1974, BBC repeated the warning that Earth was headed into a new Ice age. That prophecy didn't work out either. ... a claim echoed by TIME magazine. In 1977 The TV series "In Search Of", hosted by Leonard Nimoy, did an episode on the coming Ice age. 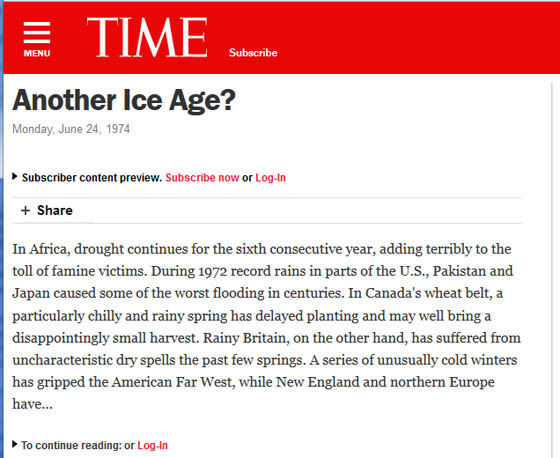 Defenders of the global warming orthodoxy deflect comments about the 1970s Ice Age hysteria by saying it was "just one or two" articles. Not so. 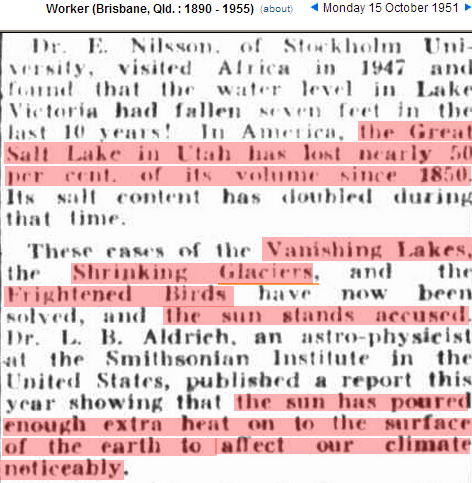 There were in fact dozens and dozens of articles claiming the Earth was headed into a new ice age! In 1983, Global warming was back, with the EPA already arguing that a carbon tax was the only solution to the problem. NBC News Digest With Jessica Savitch warned that Catastrophic warming would occur by the 1990s. 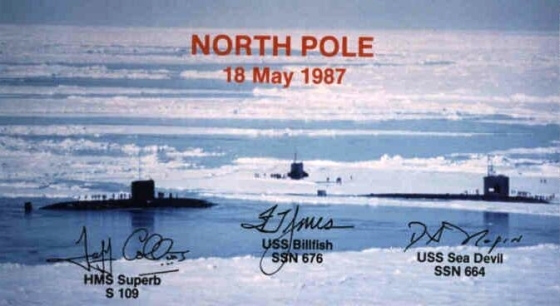 Then in 1987, two US Submarines met a British Submarine at the North Pole and again found open water, so the coming Ice Age hysteria ended! 3: What is Global Warming? Let's get something straight; the climate is supposed to change. 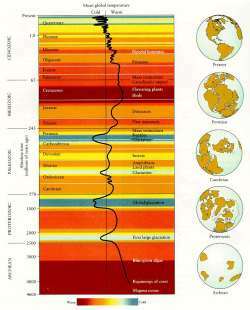 In 4 1/2 billion years, there has never been a time when the Earth's climate remained exactly the same. Careful study of the geological and paleontological record shows that the climate is always changing; that the Earth is always getting warmer or colder in long hundred thousand year cycles. At present the earth is far colder than the Cretaceous but far warmer than the ice ages. Given that the Earth has only recently come out of the Little Ice Age, it stands to reason we should be getting warmer. It is this idea that the Earth can or should be locked into a particular configuration that is artificial and unnatural. And who is to decide what the ideal temperature of earth should be? What is ideal for people living at the equator is hardly ideal for people living in the polar regions. Warmer temperatures mean longer growing seasons. Longer growing seasons mean more food. And at a time when much of the world's population are going hungry, more food is a good thing. Is carbon dioxide a greenhouse gas? Yes, it is. But it is not the only one. Water vapor is by far the most abundant greenhouse gas in the atmosphere. Methane is also a greenhouse gas, more potent than carbon dioxide. But you cannot tax water vapor, and methane is produced by termites and deep-sea microbes, which are far too intelligent life forms to submit to carbon taxes, so the global warming cultists have settled on carbon dioxide as the villain because a tiny portion of carbon dioxide in the atmosphere, about 3% including breathing, can be traced to human activity (Al Gore claimed humans are responsible for over 50% of atmospheric CO2). Now this may not seem like very much, and indeed it isn't. With volcanoes producing far more carbon dioxide than humans, one wonders what all the fuss is about regarding our cars and industry. But the global warming cult has a handy explanation. The global warming cult likes to claim that natural sources of carbon dioxide are already balanced out by natural sinks for carbon dioxide. Volcanoes are offset by trees. The carbon dioxide emitted by sea life is absorbed by seaweed. By claiming that there is no natural counterpart to human caused carbon dioxide the global warming cult tries to claim that .28% of atmospheric greenhouse gases contributed by human activity is upsetting the balance of nature. But as we pointed out before, there is no balance of nature. It is a romantic notion, but simply not reality. Experiments with enhanced CO2 in greenhouses confirms that as CO2 levels rise, plants will grow larger, absorb more CO2, driving levels back down again. How do we know an agenda is involved? Simple. If the global warming alarmists were really only interested in the welfare of the Earth, one would expect them to be delirious with joy that the threat of anthropogenic global warming doesn't really exist after all. But quite to the contrary, those whose paychecks are dependent on the global warming industry are in a total panic to reassure us that, yes, there is a real danger, and it is all our fault! Another reason we know Anthropocentric Global Warming is a hoax is that Scientific Method is supposed to allow for others to double-check the work leading to the theory. In other words, starting with the same data and applying the same methods, I should get the same results. But in the case of Anthropocentric Global Warming, this is impossible. The Hadley CRU, in response to Freedom of Information Requests for the raw data on which they based their dire predictions of doom, first stalled, then admitted they had destroyed the raw data! We mere mortals are expected to simply take their word their conclusions are accurate. I have to wonder with all the tens of millions of dollars in funding CRU enjoyed, why they could not purchase an extra hard drive to save that raw data! Maybe it's time for humans to evolve past this latest deception. Coming from a science background myself (former NASA), I value the scientific method for discerning the truth. But I also understand that individual scientists are just as corruptible as individual politicians and clergy. Just as the witch-hunters in the middle-ages who were paid to find witches saw witches everywhere they looked, so too do scientists paid to find global warming see warming everywhere they look. This has led to massive fraud on the part of what I call the "Carbonazis", from placing temperature measuring stations next to trash incinerators to the emails and computer codes from Hadley CRU that proved intentional deception to "Hide the decline." This latest IPCC report continues that fraud. BBC report on the computer codes leaked from Hadley CRU. Here is another fraud. On May 4th, 2014, a record high temperature was reported in Wichita, Kansas. Here is a photo of the weather reporting station. Now, let's pull back for the wide view to see exactly where this record high temperature occured. Here you see the part of the story you were not told. 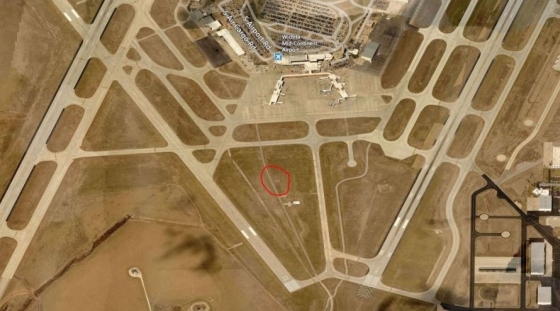 This particular weather station that captured a record high temperature is located in the middle of the Wichita airport, surrounded by passenger jets burning tons of kerosene and belching out hot exhaust gases from their engines, all day long. Think it might be a bit warmer there than the rest of the world? The United Nations IPCC released their 2013 report reasserting that global warming is real and that they are 95% certain humans are to blame. The preliminary report that was leaked admits there has been no warming at all for the last 15 years, but that climate scientists were being ordered not to reveal that fact. Der Spiegel reported that governments were pressuring the IPCC to delete the absence of warming from their report which is what appears to have happened with that report and with the more recent (and unsubstantiated) claims by both NASA and NOAA that human-caused global warming is continuing without any interruptions. Now, I don't know if the Carbonazis really view the general public as that gullible and that stupid, or they are simply reinforcing this particular deception to protect all the other deceptions, but that it IS a deception is inescapable. One would think that if stopping global warming were the real agenda, the governments and institutions who had signed on to the global warming screed would proclaim the data as proof of success in dealing with the problem, declare victory, and move onto other projects. But the real agenda all along has been to trick the public into buying carbon credits (from which Al Gore profits handsomely) and carbon taxes (which Obama is pushing for now that Obamacare has cratered and that expected tax windfall has evaporated), which is why the failure of the real world to match the draconian predictions of the global warming cult is being concealed from the public. And that alone proves the global warming issue is politics, not science. Then there was the recent video-taped admission by the head of Greenpeace Gerd Leipold that the claim he made on July 15, 2010 that Greenland would lose its ice in 20 years was merely a propaganda hoax! The major problem that the global warming cultists have faced is that the Earth has actually been cooling for more than 13 years now. 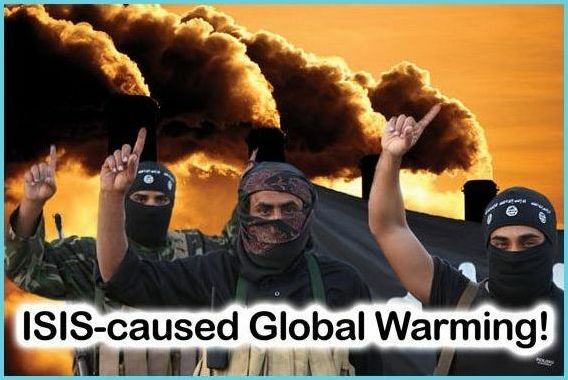 The global warming cultists attempted to re-brand by avoiding the term global warming and saying their agenda was to deal with climate change. Not just any climate change of course but sudden climate change, again the fault of humans, again requiring taxes and obedience to a global authority to solve. But re-branding as the climate change cult did not erase the fact that the predictions for a warming globe were simply not panning out. It was at this point that institutions dependent on funding to study human caused global warming began to adjust their data in order to, as CRU put it, "conceal the decline". Otherwise, trust in the climate scientists was going to be undermined by the fact that they had obviously totally blown which way the temperatures of earth were going, predicting that they were going up when in fact they were demonstrably in decline. Blue line is the raw data. The red line is the "value added" data the IPCC is using. "This is from an Australian at BMRC (not Neville Nicholls). It began from the attached article. What an idiot. The scientific community would come down on me in no uncertain terms if I said the world had cooled from 1998. OK it has but it is only 7 years of data..."
Clearly from the above Dr. Phil Jones is well aware that the Earth has been cooling for 7 (now 14) years and is clearly biased against allowing that information to be made public. 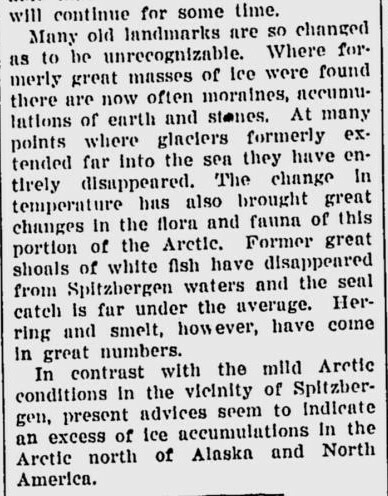 Ultimately, Phil Jones did admit on the record that there has been no warming since 1995. In the end, the most obvious evidence that the global warming cultists got it wrong, is to look out your doors and windows this winter. Snow has come early to much of the Northern Hemisphere this winter. Ski resorts have opened early, and it looks to be a very hard winter. On December 11th, 2009, 50% of the United States was under snow. On the same date the previous year, only 29% of the United States was under snow. The same global warming cultists who would point to temperature extremes 10 years ago as proof of their claims, now insist that early snows and frosts and ice should not be construed as evidence of global cooling. Clearly there is a bias at work here. 5: What is Really at Stake Here? These so-called carbon credits will be bought from those who have too many, and resold to those who need more. This will require a brokerage, of which the first one is owned by Al Gore and his investors, who stand to make billions of dollars from the trading of carbon credits. This is not unlike the manner in which Enron made billions of dollars off of the people of California by trading imbalances in electricity. It is not a coincidence that Enron's Ken Lay assisted Al Gore in setting up the structure for the trading of carbon credits. Al Gore is doing with carbon dioxide to the world what Ken lay did to California with electricity. There is a huge amount of money at stake on convincing the people of the world that the Earth is getting warmer, that it is all their fault, and atonement is attained by submitting to carbon taxation. Beyond the researchers whose degrees and funding are dependent on the continuation of a perceived public threat, the media outlets and government officials who signed onto this campaign are now realizing that they have wagered their entire credibility on AGW (anthropogenic global warming) at a time when their credibility was already strained from Saddam's "nookular" bombs, the economy, 9-11, Obamacare, etc. etc. etc. Climategate could well be the final nail in the coffin of the public's trust of corporate media and government. Clearly there's a tremendous amount of political and financial power behind the selling of anthropogenic global warming to the people of the world. 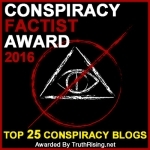 It is this political power which was able to provide Al Gore with an Academy award for his documentary film "An Inconvenient Truth" even though that film has already been exposed as containing multiple factual errors. It was this same political power which obtained for Al Gore a Nobel peace prize again for his documentary film and again awarded even though the deceptions had been exposed in a British court of law. Already we are seeing the organizers and perpetrators of this fraud trying to limit the damage from this exposure in several ways. The media is already hard at work attempting to dump the blame and scandal solely on the climate scientists, who after all were only doing what they were paid to do. This is not to say the scientists are not guilty. Quite the contrary, they deserve to be pilloried publicly and humiliated for their betrayal of the public trust and the scientific method. To say that their careers should be ended is an understatement. 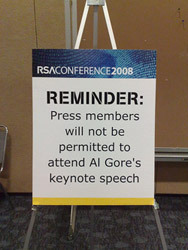 But in our haste to punish the scientists who assisted in the lies to the world, we must not forget that the scientists were working for somebody; for politicians such as Al Gore, for an agenda called global government, and for those who wanted to get rich by selling an imaginary product called the carbon credit. The latest spin is that if one questions the dogma of Anthropocentric Global Warming, then one must be in favor of destroying the Earth. There is no middle ground. Another common propaganda tactic is to accuse those who question the veracity of the Global Warming Cultists is to accuse them of receiving paychecks from oil companies. When one points out that the proponents of Anthropocentric Global Warming are being paid for their work, one gets a "hurrumph" of indignation. It's apparently acceptable for their side of the argument to be well-funded, because in their eyes they are the "good guys." Finally, there is the much-ballyhooed "Precautionary Principle" which states that one should never take any action that might cause harm even if that potential harm cannot be demonstrated or proven. In theory such a prohibition should extend to any actions undertaken in support of the Precautionary Principle itself, but such suggestions get the usual "Hurrumph" of indignation. The cultists are really good at that. So is climategate a fraud? Is climategate a scientific scandal? No. climategate is first and foremost a political scandal. More than that it is a global political scandal that involves governments, media, institutionalized science, the banks, universities, indeed a vast cross-section of our ruling classes. It is more than a scandal; climategate is a crime against humanity. And this is not an exaggeration. The goal of climategate was to extract money from every human being on planet Earth in exchange for a nonexistent salvation from a nonexistent threat. The goal of climategate was to trick every human being on planet Earth into accepting the yoke of a global oligarchy with no more legitimate claim to power than those who ruled by divine right. We are at a watershed moment. We may well see a transition to a new and better political structure for the entire world. But it will not be the one that has been designed for us. If nothing else, the ability for government and media to lie to the population of the world on such a vast scale is forever destroyed. Climategate will relegate all of the official stories of the governments of the United States and Great Britain and indeed every government that took part in the human caused global warming hoax to the same level of credibility as Ramses carvings showing his victory over the Hittites (he actually lost that war). It will be seen as an historic joke by future generations. So, what we, the free people of planet Earth, need to do in the coming years is become the new mainstream media. The TV networks and other corporate media have been handed their marching orders to resell the illusion of human caused climate change in any way shape or form that will convince you to accept new taxes and the loss of your freedoms. The only way the rest of the world is going to find out about climategate is if you tell them. Because the TV and news magazines won't. If it's mentioned at all, it will be to trivialize and dismiss it and assure the world it really doesn't matter. BBC is still reporting climategate as just another computer crime. This is like reporting Watergate as just another burglary! We have collected together a vast body of evidence calling into question the legitimacy of the claims of human caused global warming. We have collected together a vast body of evidence proving fraud and deception on the part of the global warming cult. Please forward this information to everybody you know. Time is of the essence. Barack Obama as already indicated that he will not be swayed by the exposure of the fraud in the CRU/NWIA data, and fully intends to go to Copenhagen to sign away our national sovereignty as "penance" for our contribution to global warming. Climategate may well prove to be the final fight in the war between those who would rule us with lies and those who wish to live with truth. Climategate makes it clear that yes, there really are massive conspiracies between government and the media to mislead the general public. You cannot pretend they don't exist; one is right there before you staked out naked on the ground, exposed for all to marvel at! I leave it as an exercise for the reader to decide how many other such deceptions form what we think we know of the world and of history. FOOTNOTE: A Not Quite Complete List of Things Blamed on Global Warming! HIGHLIGHTS FROM 2013-2014 GLOBAL WARMING! 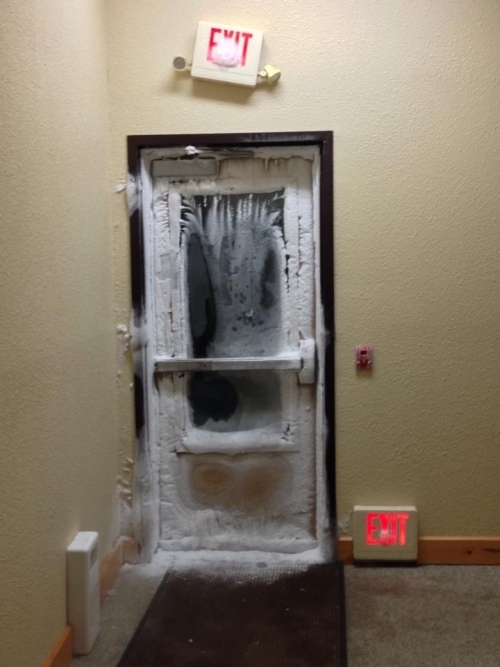 1/4/2014: Photo of a frozen door in Minnesota. This is taken from INSIDE the building! 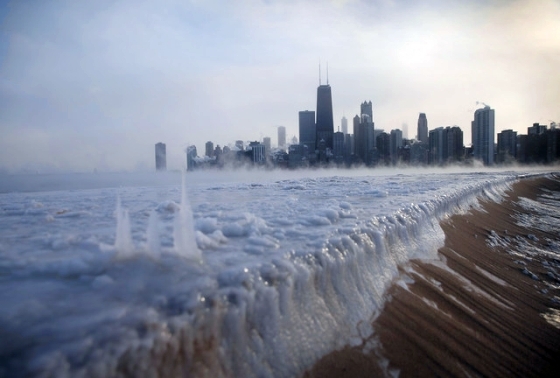 1/4/2014: GLOBAL WARMISTS: MELTING ICE CAPS CAUSE EXPANDING ICE CAPS! *This is NOT satirical! 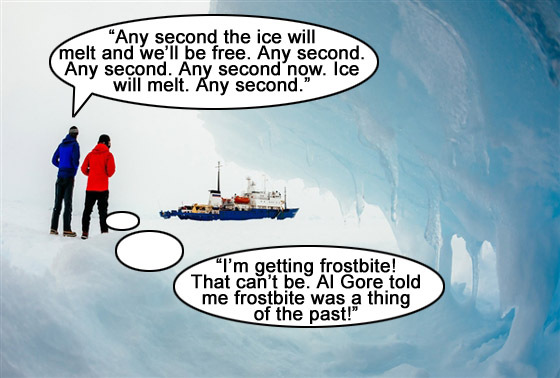 By now you have probably read the hilarious story about the MV Akademic Shokalskiy, a ship filled with global warming researchers funded to "prove" that global warming was melting the Antartic ice shelf. So they sailed down to Antarctica for the start of the summer season in the Southern Hemisphere, because summer is a great time to get lots of photos and videos of melting ice. Or so they thought. In 2014 the Antarctic ice sheet was 26% larger than 2013 and "unusually thick" and the ship got stuck in ice. An icrebreaker was sent to save the global warming researchers; it too became trapped. 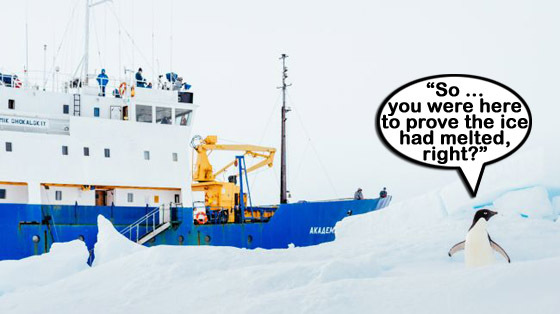 A third icebraker rescued the global warming researchers by helicopter. Despite a record-setting sanowstorm in Janurary 2014, the corporate media was still trying to claim that global warming is accelerating! Obviously, it is reckless to be pushing the global warming agenda in the middle of a harsh winter, but I suspect that with Obamacare having failed to generate the expected flood of new tax revenues that Obama will go back to calling for a carbon tax as soon as the snow starts to melt, and is desperate to keep the public from thinking about how cold the winter of 2013-2014 was and how much colder the winter of 2014-2015 is likely to be. 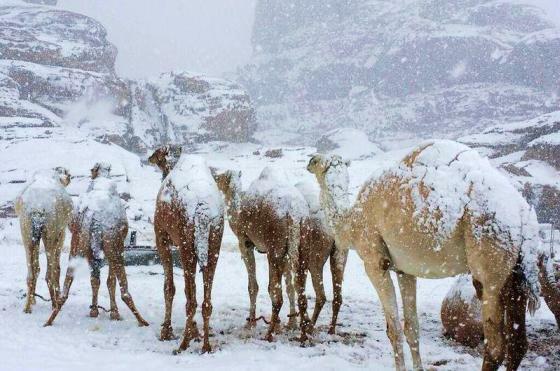 12/16/2013: Snow falls on camels! 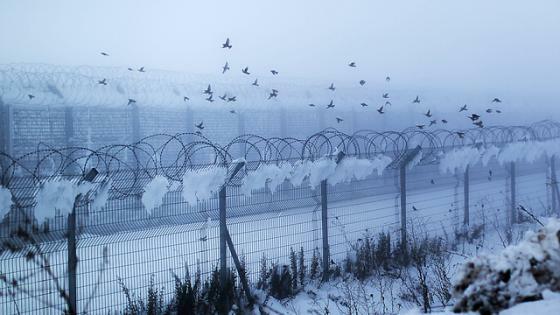 12/15/2013: Snow falls on Israel's apartheid wall. 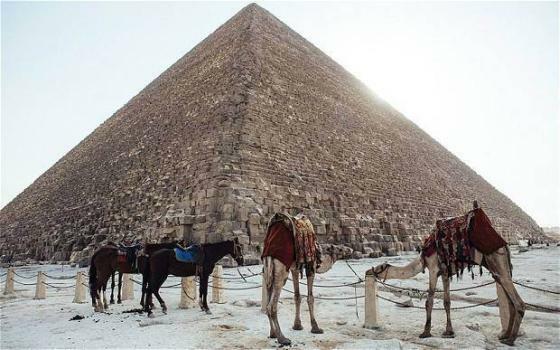 12/14/2013: Snow falls on the Pyramids. 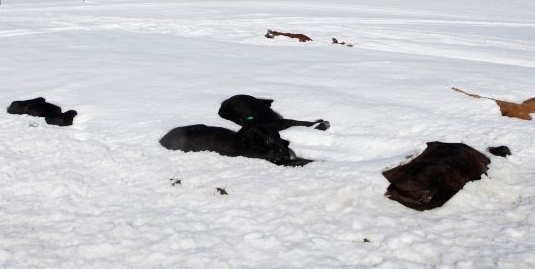 Cattle killed by surprise early October 2013 snowstorm in South Dakota. I do not care how many scientists traded their honor for global warming funding. Science is not a democracy where the majority rules. In 1633, virtually every scientist was in agreement that Galileo was wrong when he concluded that the Earth moved around the sun. Motivated by peer pressure, the church, and fear of losing their jobs, all those scientists went along with the desired agenda, and history eventually showed they were all, down to the last man, flat-out wrong. ... and back to catastrophic global warming in the 2000s. 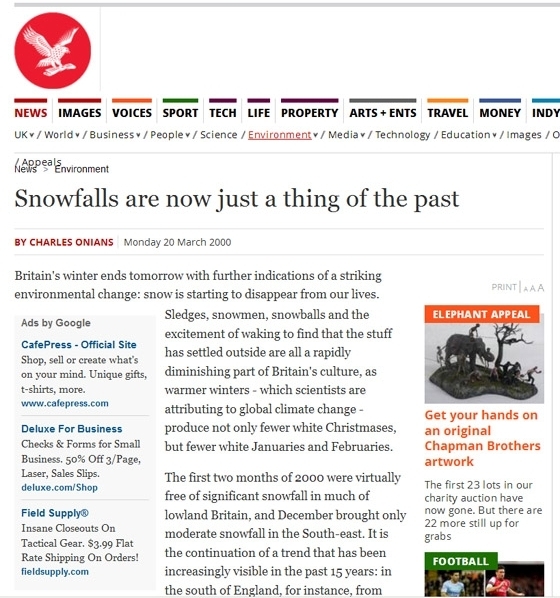 On March 30, 2000, the UK Independent reported that "Snowfalls are now just a thing of the past." UPDATE: As of October 1, 2015, the UK Independent pulled this page from their website. 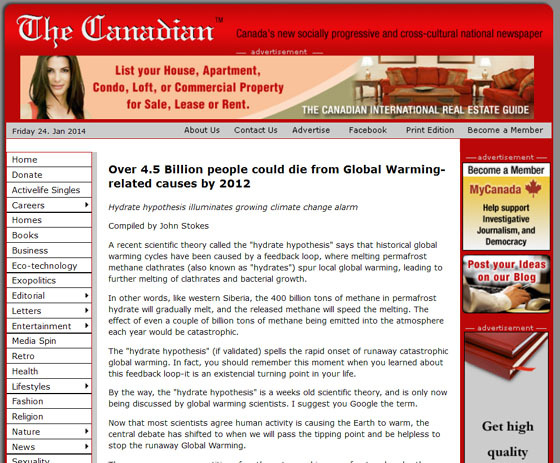 Back in 2007, the Canadian reported that "Over 4.5 Billion people could die from Global Warming-related causes by 2012"
It is now 2015, and we are all still here (except for the people who froze to death last winter). Click for larger image Another "Snow will be a thing of the past" epic fail, this one from the New York Times in 2012! Since Al Gore started this nonsense, we have had 17 years of provable cooling. So NASA, NOAA, HCRU, IPCC, etc. etc. etc. can scream global warming all they want, to justify the theft from the people under the rubric of "saving the world", but the public will simply look out their doors and windows in the coming months and realize that human-caused global warming is no more real than Saddam's nuclear weapons or Assad's Sarin gas. Scientists who bet their reputations on the global warming craze are trying to explain their way out of this mess. Some, unable to admit their fraud, have gone as far as to claim that global warming causes cold weather. This stands in direct contrast to the claims made by these same scientists back in 2000 that snow would be a thing of the past. Indeed, Al Gore himself repeated the claim that snow would be a thing of the past in 2009! 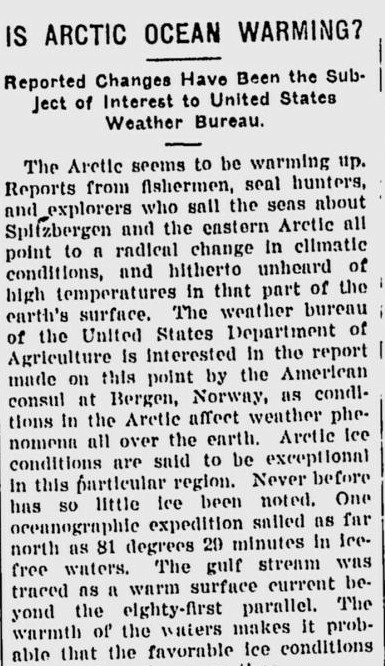 Al Gore also predicted that summer of 2014 would see an Arctic entirely free of ice. In fact this summer there was more ice in the Arctic than previous years. Evansville Wyoming, 9/27/2013, sent in by a reader. 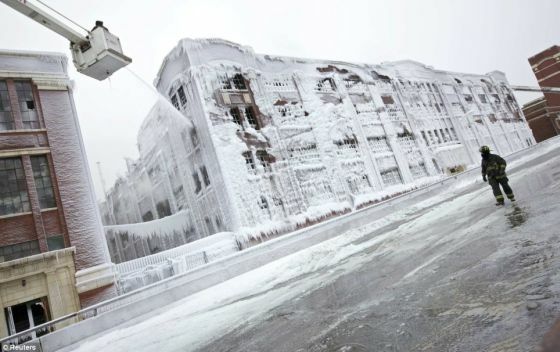 In Chicago, it was so cold last winter that water coming out of the hoses of firefighters froze against the side of the burning building they were trying to save. NASA confirms that we are seeing a "mini-Maunder" event, a repeat of the "Maunder Minimum"; an observed decrease in solar activity which triggered the "Litte Ice Age" that chilled Europe from the mid 1300s to the mid 1800s.. The reality is that climate on Earth always changes. It was changing before humans were here and will go on changing long after we are gone. 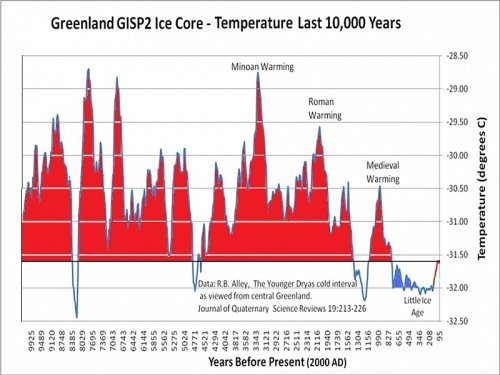 The dominant controls over climate are solar activity (as demonstrated when the Maunder Minimum triggered the Little Ice Age), and the shape of the Earth's orbit, which slowly oscillates from circular to more elliptical and back over roughly 100,000 year cycles. When Earth's orbit is circular, Earth is warmer. When the orbit is more elliptical, Earth spends more time further away from the sun at the far end of the ellipse (Kepler's laws of orbital motion) and we get the ice ages. So until the global warming crowd can influence the sun or change the shape of Earth's orbit, they cannot really stop climate change. All they can do is trick the public out of money by screaming about it. Al Gore claims the temperature of the Earth's interior is "millions of degrees". It is actually only 12,000 degrees. The academic at the centre of the ‘Climategate' affair, whose raw data is crucial to the theory of climate change, has admitted that he has trouble ‘keeping track' of the information. Professor Jones told the BBC yesterday there was truth in the observations of colleagues that he lacked organisational skills, that his office was swamped with piles of paper and that his record keeping is ‘not as good as it should be'. 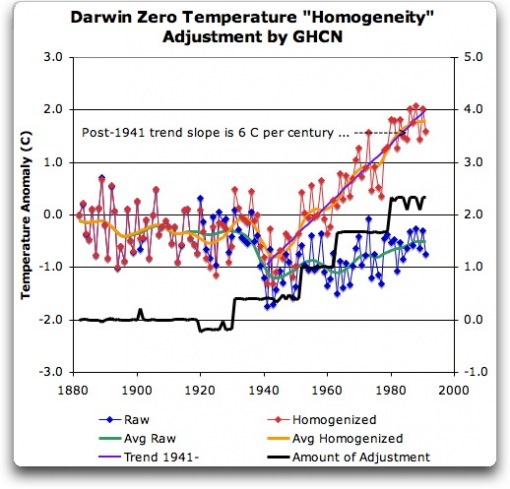 The data is crucial to the famous ‘hockey stick graph' used by climate change advocates to support the theory. Professor Jones also conceded the possibility that the world was warmer in medieval times than now "suggesting global warming may not be a man-made phenomenon. " And he said that for the past 15 years there has been no ‘statistically significant' warming. BREAKING NEWS: NOAA admits satellite "defective"; reported global temperatures 10 - 15 degrees too hot! ! ‘NOAA-16' was launched in September 2000, and is currently operational, in a sun-synchronous orbit, 849 km above the Earth, orbiting every 102 minutes providing automated data feed of surface temperatures which are fed into climate computer models. World-renowned Canadian climatologist, Dr. Timothy Ball, after casting his expert eye over the shocking findings concluded, “At best the entire incident indicates gross incompetence, at worst it indicates a deliberate attempt to create a temperature record that suits the political message of the day." Chart of Earth's Temperature When we open up the scale of a chart of Earth's Temperatureto a much longer period of history, we see that there is nothing at all abnormal about the current climate. We are warmer than the ice ages (one of which we just came out of) but colder than the Cretaceous. And ignoring the effects of the Chixulub Asteroid Impact, life on Earth seems to have survived quite well at far warmer temperatures than we have now. 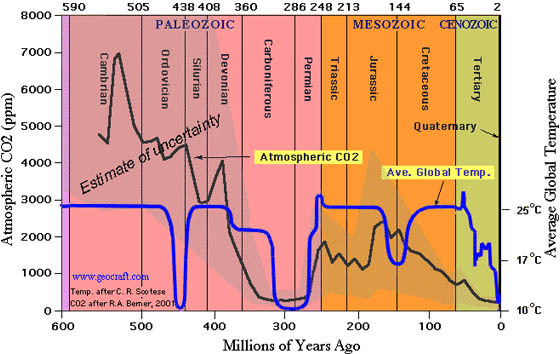 Chart of Earth's Temperature versus CO2 over Geological time In prehistoric times CO2 levels were much higher than they are today without producing an increase in global temperature. Al Gore Set To Become First “Carbon Billionaire"
Why is “Climategate" Getting Little to no Coverage? 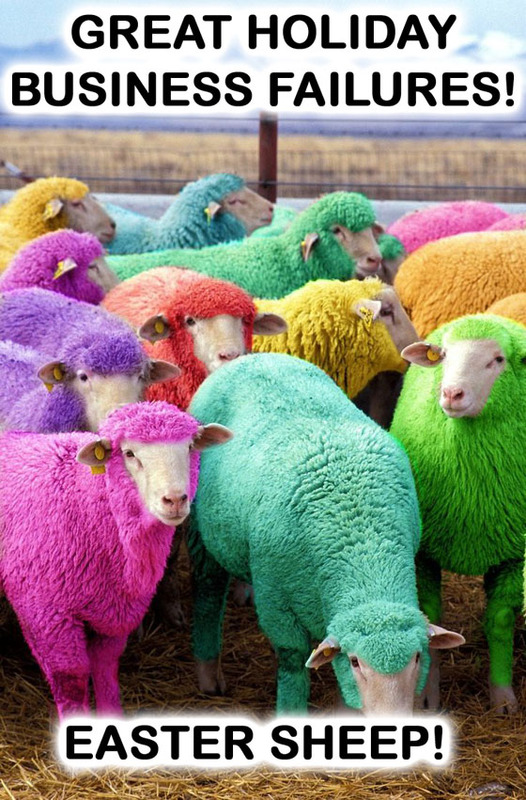 NEW ARTICLES: GLOBAL WARMING CULTISTS CAUGHT. MORE SCANDALS; GLACIERGATE AND STORMGATE. HEAD OF IPCC APOLOGIZES! "One has to free oneself from the illusion that international climate policy is environmental policy. This has almost nothing to do with the environmental policy anymore, with problems such as deforestation or the ozone hole." Ottmar Edenhofer -- Co-chair of the U.N.'s Intergovernmental Panel on Climate Change working group on Mitigation of Climate Change from 2008 to 2015. Warming fears are the "worst scientific scandal in the history...When people come to know what the truth is, they will feel deceived by science and scientists." - UN IPCC Japanese Scientist Dr. Kiminori Itoh, an award-winning PhD environmental physical chemist. "It is a blatant lie put forth in the media that makes it seem there is only a fringe of scientists who don't buy into anthropogenic global warming." - U.S Government Atmospheric Scientist Stanley B. Goldenberg of the Hurricane Research Division of NOAA. "I am a skeptic...Global warming has become a new religion." - Nobel Prize Winner for Physics, Ivar Giaever. "If we don't overthrow capitalism, we don't have a chance of saving the world ecologically. I think it is possible to have an ecologically sound society under socialism. I don't think it is possible under capitalism" - Judi Bari, principal organiser of Earth First! "We must make this an insecure and inhospitable place for capitalists and their projects. We must reclaim the roads and plowed land, halt dam construction, tear down existing dams, free shackled rivers and return to wilderness millions of acres of presently settled land." - David Foreman, co-founder of Earth First! "My three main goals would be to reduce human population to about 100 million worldwide, destroy the industrial infrastructure and see wilderness, with it's full complement of species, returning throughout the world." -Dave Foreman, co-founder of Earth First! The above few quotes make it clear that the elites' idea of an ideal world is one they have all to themselves! "The extinction of the human species may not only be inevitable but a good thing." - Christopher Manes, Earth First! In June 2007, Tim Flannery warned Brisbane that its “water supplies are so low they need desalinated water urgently, possibly in as little as 18 months". Last month Brisbane recorded the wettest December in 150 years. Within a few years "children just aren't going to know what snow is." Snowfall will be "a very rare and exciting event." Dr. David Viner, senior research scientist at the climatic research unit (CRU) of the University of East Anglia, interviewed by the UK Independent, March 20, 2000. "[By] 1995, the greenhouse effect would be desolating the heartlands of North America and Eurasia with horrific drought, causing crop failures and food riots...[By 1996] The Platte River of Nebraska would be dry, while a continent-wide black blizzard of prairie topsoil will stop traffic on interstates, strip paint from houses and shut down computers." Michael Oppenheimer, published in "Dead Heat," St. Martin's Press, 1990. "Arctic specialist Bernt Balchen says a general warming trend over the North Pole is melting the polar ice cap and may produce an ice-free Arctic Ocean by the year 2000." 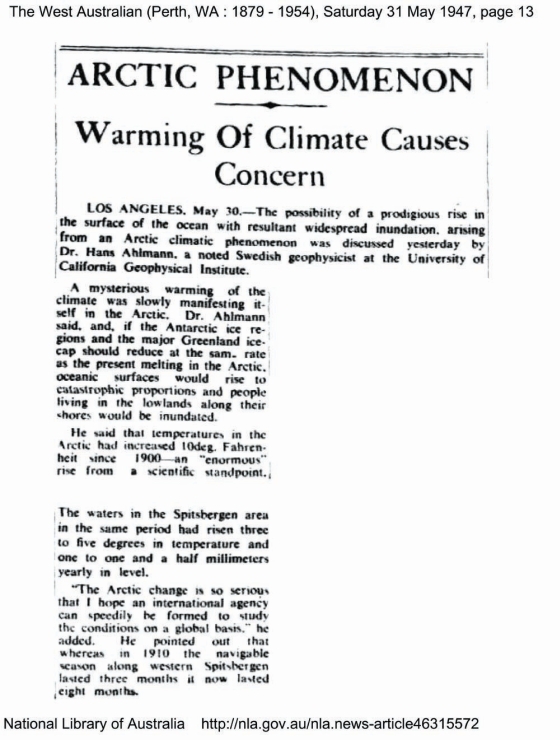 Christian Science Monitor, June 8, 1972. "Using computer models, researchers concluded that global warming would raise average annual temperatures nationwide two degrees by 2010." Associated Press, May 15, 1989. "By 1985, air pollution will have reduced the amount of sunlight reaching earth by one half." Life magazine, January 1970. 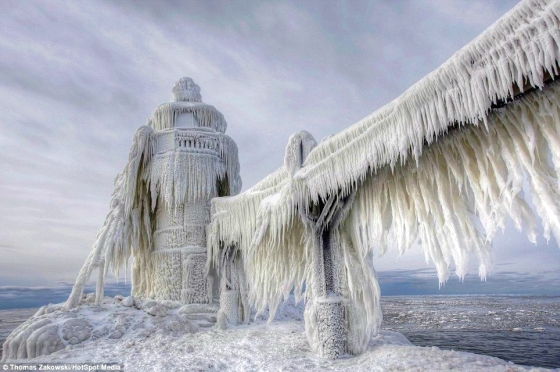 "If present trends continue, the world will be ... eleven degrees colder by the year 2000. 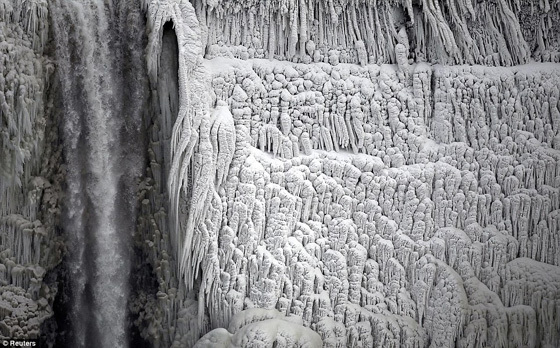 This is about twice what it would take to put us in an ice age." Kenneth E.F. Watt, in "Earth Day," 1970. "By the year 2000 the United Kingdom will be simply a small group of impoverished islands, inhabited by some 70 million hungry people ... If I were a gambler, I would take even money that England will not exist in the year 2000." Ehrlich, Speech at British Institute For Biology, September 1971. There are currently 3 users and 1325 guests online.